Orchendor is a Bosmer spellsword found at Bthardamz Arcanex. 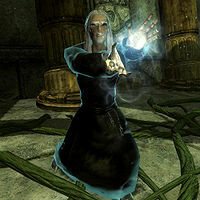 He is a former servant of Peryite and was asked by the Daedric prince to gather the survivors of a plague attack on Mundus and lead them to Bthardamz. Inside the Dwemer ruin, Orchendor quickly lost his way and made a personal army out of the Afflicted. Because of his betrayal, Peryite will ask you to kill Orchendor during the related quest. He wields a leveled, enchanted dagger of the best possible quality and a randomly chosen staff. He carries a wide array of loot, including leveled gems, and a boss-leveled amount of gold. He wears black mage robes until level 8, when he may shift into enchanted robes. He also wears a leveled ring of Destruction and a leveled necklace with a healing enchantment. His footwear is leveled as well and can be either light or heavy armor. The light footwear ranges from a pair of hide boots at level 1, to a pair of dragonscale boots at level 46. The heavy footwear ranges from iron boots at level 1 to daedric boots at level 48. Lastly, he wears a pair of gauntlets with the exact same stats as his footwear. He has a broad arsenal of spells from various magic schools as well as a toxic vomit attack. Upon being hit between three to five times in a row, he will teleport a short distance away from you. When he comes out of the teleportation, there is a brief window where he is unable to attack or be attacked. Orchendor has an innate 100% magic resistance, a side-effect of his Teleportation ability, making him an extremely difficult opponent if you rely heavily on magic. This also makes it impossible for him to be affected by certain enchantments or effects, such as soul trap, without the use of a Weakness to Magic poison. He is one of the best candidates for Dead Thrall due to his level cap and abilities. This page was last modified on 5 February 2017, at 03:44.